Let's take a peek at the Easter basket and see what's blooming this holiday weekend. The arrival of our Texas state flower, the Texas bluebonnet (Lupinus texensis), is always time for celebration during the month of March. Today I'm joining Gail at Clay and Limestone for Wildflower Wednesday. 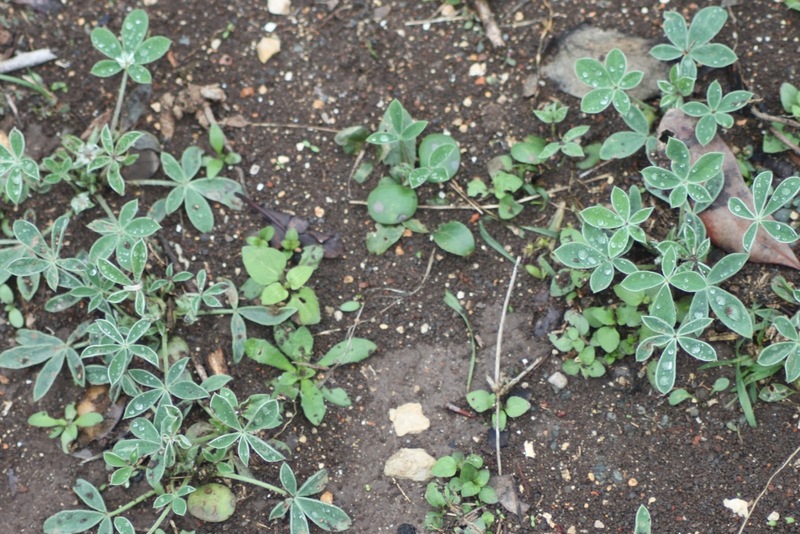 The extended drought across Texas means 2013 has not been the best year for bluebonnets in the fields and along state highways. These in my back yard have been watered during dry spells to help them bloom. When I spotted this garden a few days ago I just had to stop and take photos from the car. 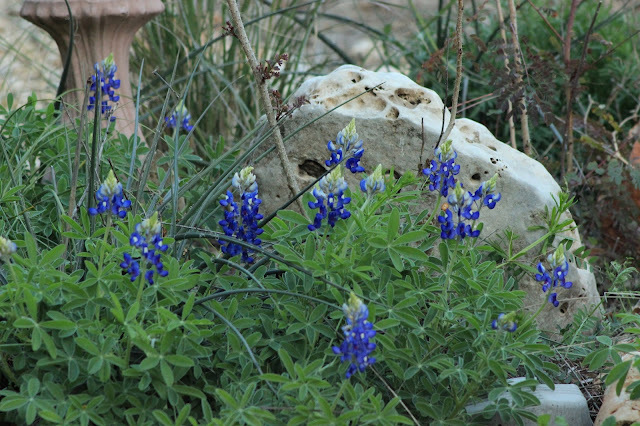 Bluebonnets are often seen in the wild with orange indian paintbrush flowers as a color complement. 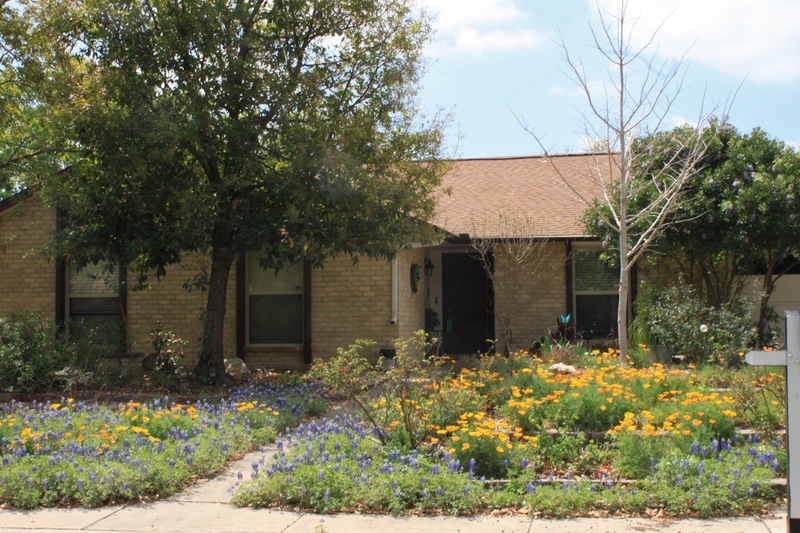 The indian paintbrush doesn't seem to do well in captivity in our area while bluebonnets flourish in yards all over town during March. Bright yellow and orange poppies are an inspired choice to pair with the bluebonnets in this front garden. Have you recently been looking at your lawn as more of a chore than an asset? Want to do something about it but don’t know where to start? 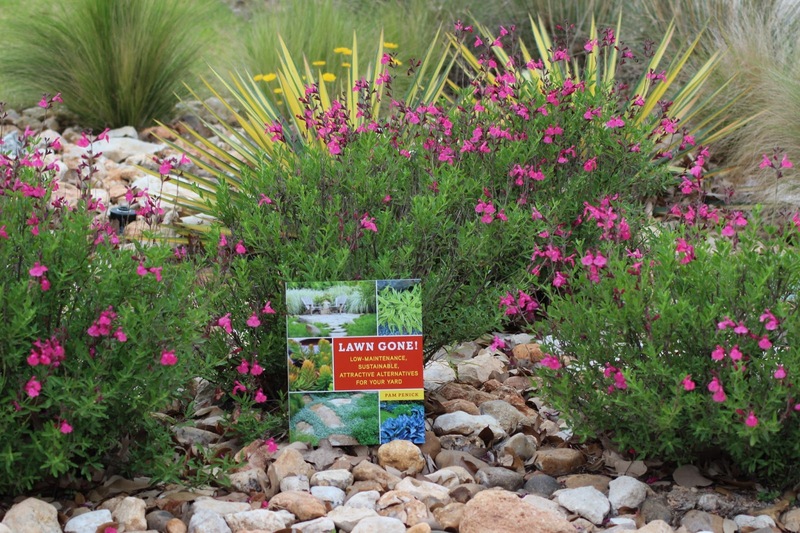 You can start with Pam Penick’s new book Lawn Gone! which provides not only the philosophy and rationale for partially or completely replacing your lawn but also follows it up with clear options and steps you can take to get there. So it provides both food for thought as well as planning and execution tips. Today I’m joining Holley at Roses and other Gardening Joys for her garden book review meme. Of course, you knew my first garden book review would be for Pam Penick’s Lawn Gone! 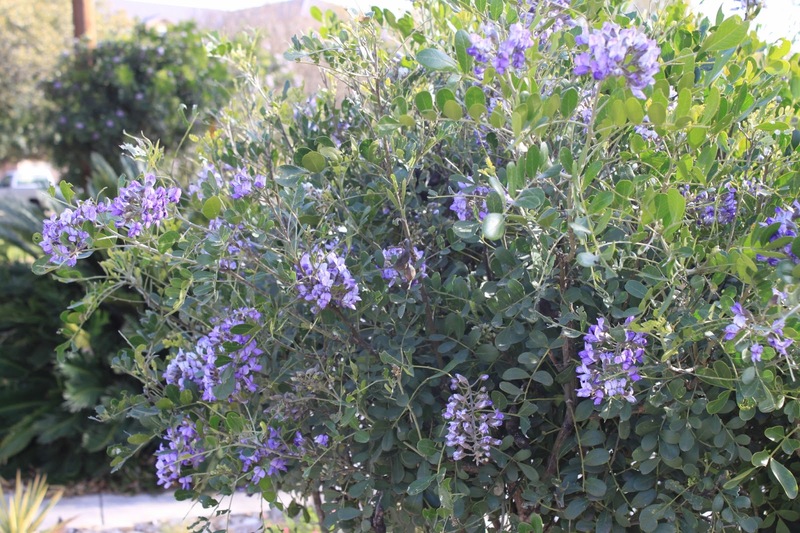 Foliage Follow-up is sponsored by Pam Penick at Digging the day after Garden Blogger's Bloom Day each month to show off the foliage in our gardens. This week we are very busy in the garden preparing it for summer. Even though the calendar will turn to spring soon we are due to hit 90F/32C by Monday and that means summer weather. Our spring is typically short because our winter weather is spring-like compared to many parts of the country. 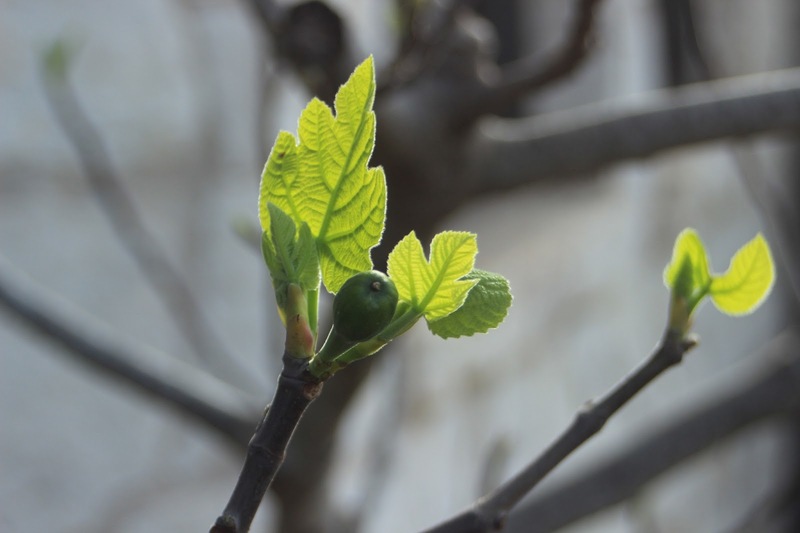 Spring foliage is special for the fresh green color of newly emerging foliage like this fig tree. The fig is a breva fig formed on old wood which usually falls off as the new crop forms on new stems. 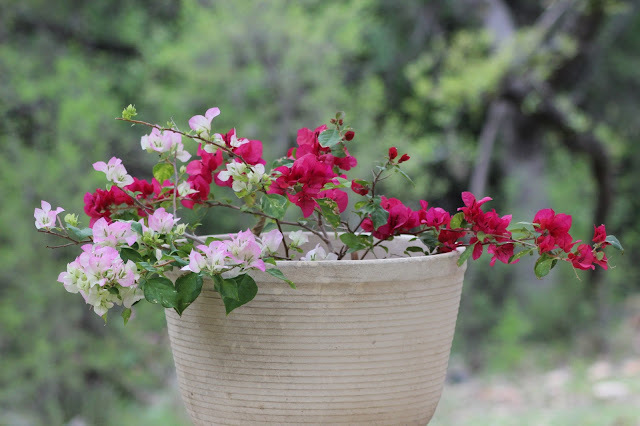 Gardens Blogger's Bloom Day sponsored by Carol at May Dreams Gardens is special day for garden bloggers to share what's blooming in their gardens on the 15th of each month. 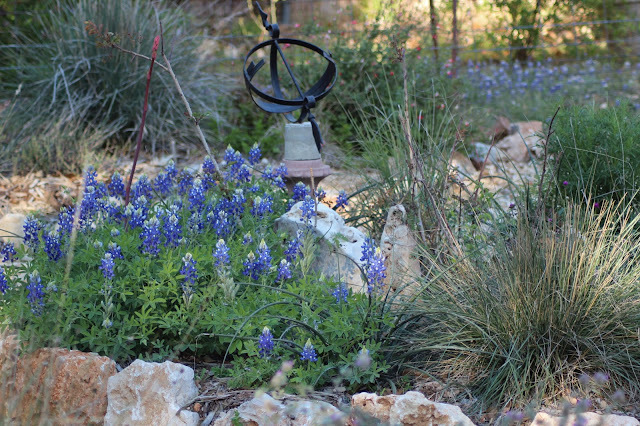 March in Texas is bluebonnet season when our favorite native wildflower, Lupinus texensis, takes center stage. A few years ago we planted a patch in our back yard and they have begun blooming right on schedule this week. This is a preview and they will get their own post next week. It's time for the Winter Walk-off sponsored by Les at A Tidewater Gardener. Last year I gave the walk-off a try and the resulting photos were so boring I didn't even post them. So you wanna see my neighborhood? Yes? No? Either way you're going to see it this year. On your own two feet, leave the house and share what can be seen within walking (or biking) distance of your home (if you want to drive to your walk that's OK too). Your post does not have to be about gardening or a travelogue, unless you want it to be. 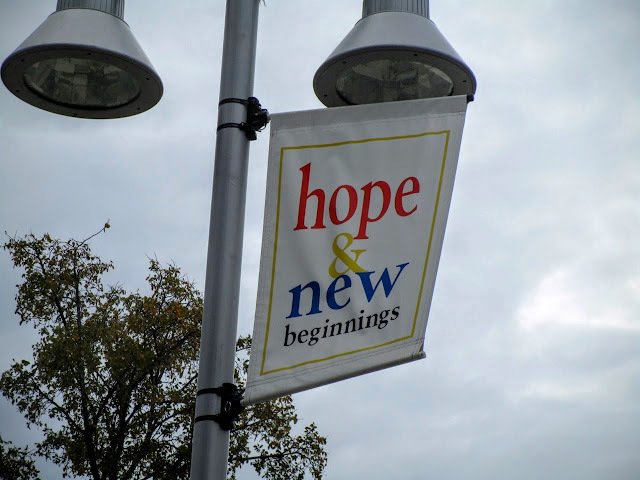 Maybe instead you will find some unusual patterns, interesting shadows, signs of spring, a favorite restaurant or shop, questionable landscaping or local eyesores. Whatever, just keep your eyes and mind open, be creative and have fun, but don't show anything from your own garden. I considered posting one of my River Walk adventures instead. After all, Les said we could drive to our walk. That's too easy though and I really want to show you my own neighborhood. There are many special things that make it one of the more desirable areas of the city: the live oak trees chief among them. They set the backdrop for a wide variety of gardening and landscaping options. 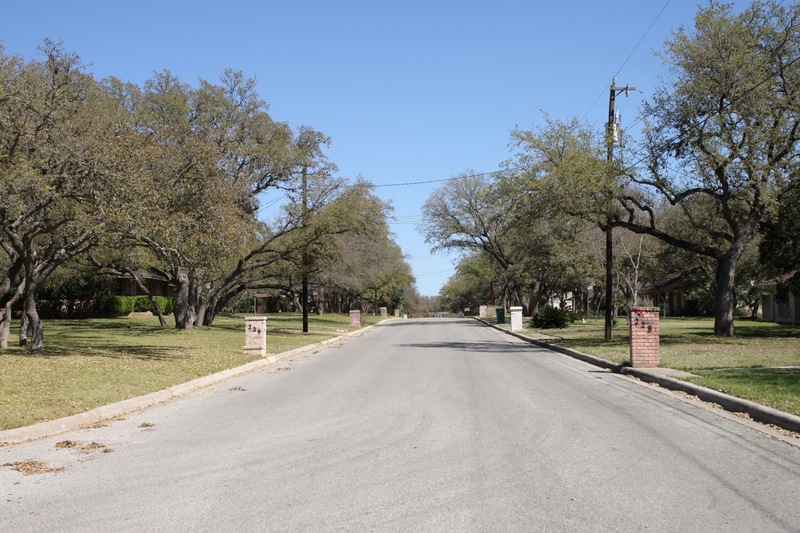 But among the challenges are the lack of sidewalks and deep set-backs for the houses mixed with a very laid-back approach to yard maintenance. So here we go on a walk around the 'hood. Of course I picked trash day and brush pick-up week to do this so the photography would be more fun! Boorrring! This isn't my street, but a nearby one just like it. I actually forgot to get a picture of my street. Let's keep going, there are some fun things to see along the way. I promise. To de-moss or not to de-moss, that is the question. 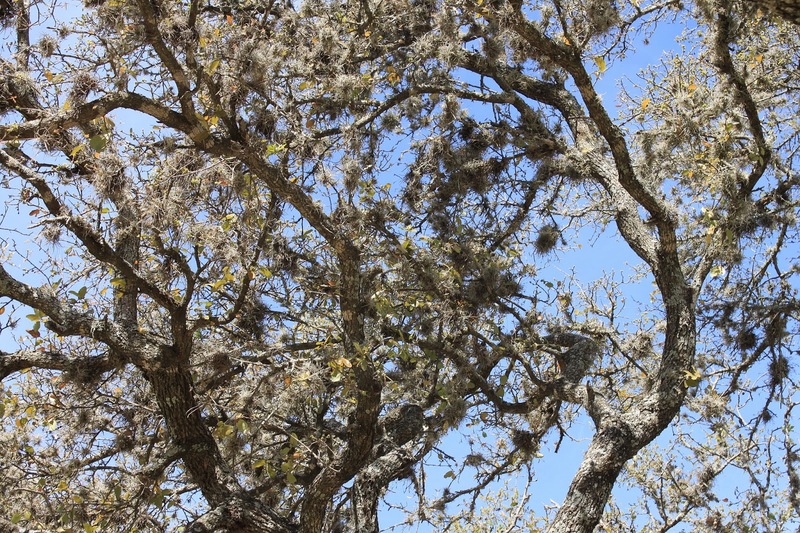 It's not really moss, it's Tillandsia recurvata and it clings to the live oaks in our area. Ball moss doesn't directly harm the trees but it does accumulate and looks ugly. When it takes over a tree it can block the light causing early demise of lower limbs and can partially block the view. But mostly it just looks ugly. More new plants for Spring! It's like gardening Christmas. 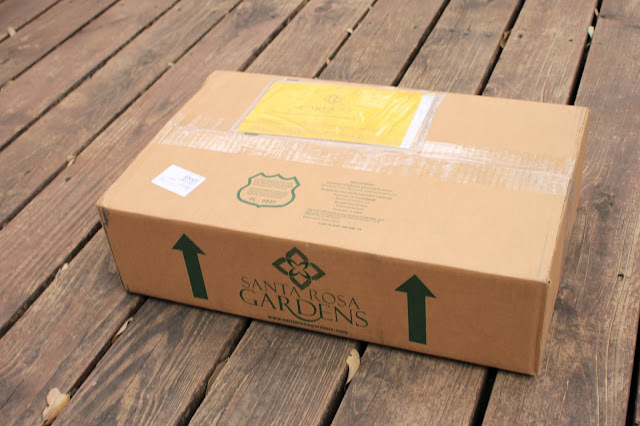 New plants are always fun and finding a box of new plants on the porch, as I did Wednesday afternoon, is even more fun. With so many good native and adapted plants available locally it's easy to find plants I need so ordering plants online is rare for me. When Santa Rosa Gardens had a pre-season sale in January I decided to give them a try. I've had my eye on their white-blooming Gulf Muhly (Muhlenbergia capillaris 'White Cloud') and haven't found it locally so ordering was the best way to go. I easily found several other plants to try in my garden. They even let me pick my ship date nearly six weeks ahead so I didn't have to hold the plants through the winter. In our warm climate we don't wait for April showers. Signs of spring are all around the yard this week and quite a few blooms are springing up.